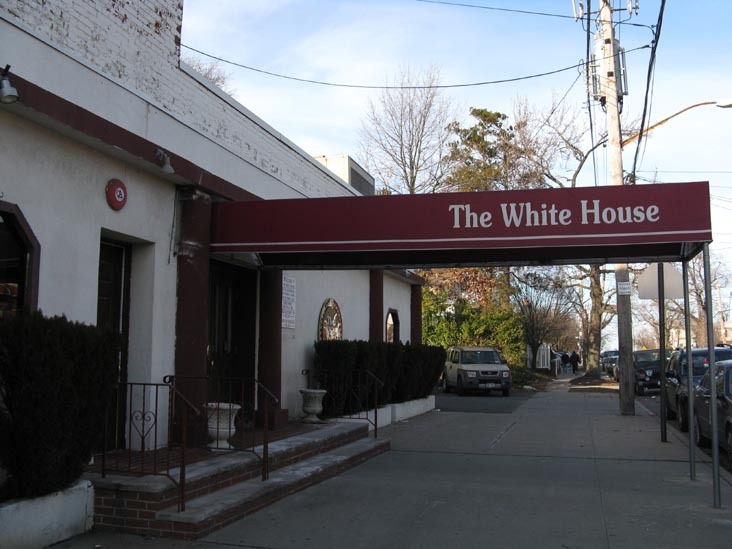 State Senator and residents opposed addition of catering hall to Whitestone restaurant. On June 29, 2011, the City Council approved a modified version of Joe Franco’s proposal to rezone the western side of 154th Street between 10th and 11th Avenues in the Whitestone section of Queens. The plan rezoned five lots and will facilitate the expansion of Franco’s White House restaurant located at 10-24 154th Street. The White House currently contains a cellar-level banquet room, a ground-floor restaurant, and a vacant apartment on the second floor. Franco proposed rezoning the western frontage of 154th Street from R2A to R3-1 with a C2-2 commercial overlay in order to renovate and enlarge the second floor to contain a 20,512 sq.ft. catering hall. The project would also provide 110 surface and below-grade parking spaces. The surrounding neighborhood is characterized by a range of commercial, manufacturing, and residential uses. Franco owns the lot immediately south of the White House, which includes a two-story mixed-use building and a parking lot that wraps around the rear of the restaurant. The lots immediately to the north of the White House include two single-family homes and a bank. In 2005, as part of the Whitestone Rezoning, the City rezoned portions of the five lots from R2 to R2A. The interior portion of the block to the east was rezoned from R2 to R3-1. 3 CityLand 3 (Feb. 15, 2006). Queens Community Board 7 and Borough President Helen M. Marshall supported Franco’s proposal. Marshall, however, recommended that the commercial overlay not include the residential properties to the north and that Franco use plantings to screen the restaurant from the adjacent residential property. Those testifying in support in cluded Geri Entler, an employee of Franco’s, who claimed that the project would revitalize the area by creating more than 100 jobs. Local Council Member Daniel J. Halloran, speaking through a representative, claimed that the area had been “inaccurately” rezoned in 2005, which pushed Franco’s site into further non-compliance with the zoning regulations. Halloran, however, opposed extending the commercial overlay to the residential properties. The Commission modified the plan by removing the proposed commercial overlay from the residential properties north of the White House. The Commission noted that Franco had agreed to provide an eight-foot landscaped buffer adjacent to the residential property. Commissioner Anna Levin opposed the proposal. At the Commission’s review session on April 11, 2011, Levin stated that altering the 2005 rezoning would undermine the integrity of the Commission’s decision-making. Opposition remained at the Council’s Zoning & Franchises Subcommittee hearing. Council Member Halloran acknowledged that the proposal had divided the community, but noted that Franco had agreed to the landscaped buffer area and was willing to relinquish the White House’s existing cabaret license. Brian Garry reiterated his opposition and accused Halloran of acting as a lobbyist for Franco. Urban planner Paul Graziano applauded the decision to reduce the commercial overlay, but requested that the residential properties be removed entirely from the rezoning proposal. The hearing was closed without a vote. When the Subcommittee reconvened, Chair Mark S. Weprin announced that the plan had been modified to extend the commercial overlay’s northern boundary five feet. The modification would permit Franco to create the landscaped buffer zone while still providing a sufficiently wide entrance to the restaurant’s parking area. The Subcommittee and Land Use Committee approved the modified proposal, and the Council sent the modified plan to the City Planning Commission for review. At its June 20 review session, the Commission found that the modification was within the scope of the rezoning. The full Council unanimously approved the proposal. Lead Agency: CPC, Rev. Neg. Dec.
Council: 10-24 154th Street Rezoning (C 100457 ZMQ – rezoning) (June 29, 2011) (Architect: Papa Architect PC).